HAPPY B-DAY ROMKE! Great self portrait! :-) Tweedle-Dee & Tweedle-Dum ! Proficiat , Romke. Er is er een jarig hoera hoera, happy birthday Romke. Thanks Harry! That\'s a wonderful present! I had totally forgotten about this picture, it\'s a beautiful surprise. The story behind "Romke & Harry near Matterhorn, Switzerland"
I am taking the picture, he is on the right on this resulting image. We used a sponsored small Nikon camera with a superfisheye lens, covering 185 degrees in all directions. The beautiful Matterhorn is actually quite close to us -we are on the end of one of the ridges- but due to the distortion it looks far away. With 2 of these stitched together we could create a 360 degrees IPIX.. This one is for Romke, who is celebrating his B-day today :)He accompanied me on several trips, including Mt Blanc, Uganda and this special undertaking: a tandem-bike ride from Amsterdam, The Netherlands to Zermatt, Switzerland. 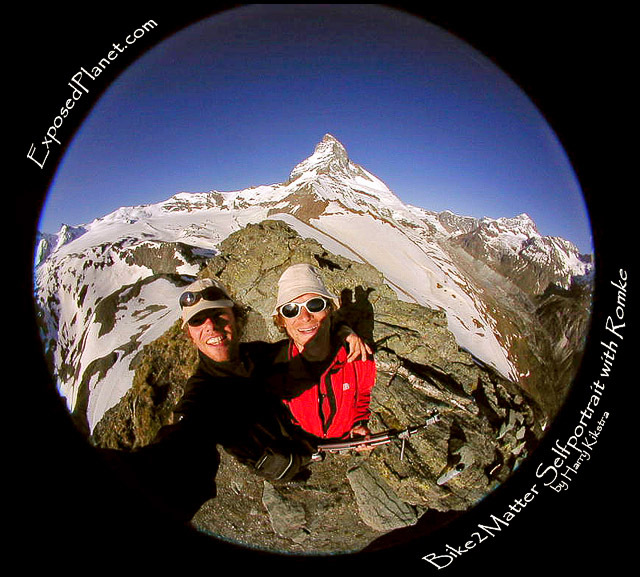 We had planned to climb the Matterhorn, but conditions were too dangerous and even the local guides did not go up.